Listen to them speak about their experience. And then read on! Work with me for a moment on a short thought experiment? You are an accomplished researcher. You love what you do, and the number of times you’ve been cited in the literature tells you that your work is not only respected, but also useful to your peers in academia. As a thoughtful professional, you have observed that when you collaborate with practitioners in your field, they tell you that they either don’t, can’t, or won’t read articles published in academic journals. Unintelligible, they tell you. Too abstract, they insist. Bring up what they are missing, and you get the hand, so to speak. But you know the research is solid and the results valuable. How might you bridge those gaps between content, delivery, and reception? What might you design? I’m a practitioner myself, and although I’ve done considerable academic reading, I’m also cognizant of the effort it takes to read articles written for an academic audience, especially at night, after a full day of work and family life. Having served as a principal investigator for a research project over the past year, I have also experienced the difficulty of summarizing dense research so that it resonates with the practitioner community. So when Dr. Suzanne Geigle approached Cynthia Gilmer and me about writing a proposal for a workshop at the Academy of Management (AOM) Annual Meeting to help make academic research more accessible to practitioners, we were all ears. Suzanne is Chief Scientist, Enterprise Transformation in MITRE’s Enterprise Strategy and Transformation (ES&T) Technical Center, and the topic that had piqued her interest was how to apply design thinking to bridge the theory-practice gap. Cynthia and I work in MITRE’s Business Innovation Department, alongside Suzanne. Design thinking is an integral part of our work: helping MITRE’s customers identify and solve their problems at the enterprise level. Suzanne explained that one of the issues AOM has faced for years is that although a plethora of relevant research on management from the academic community is on offer, this research is either ignored or poorly understood by management practitioners. The lack of communication has become such a problem that AOM created a cross-cutting group known as the Practice Theme Committee to help connect the two worlds. At the time, in late 2016, Cynthia and I were deeply immersed in our research project, a qualitative research study on how design thinking is applied in the government (and, yes, reading many academic articles). We were also applying these methods internally within MITRE’s research program to bring together researchers and the customer-facing MITRE staff to develop research proposals that were acceptably rigorous to the researchers and sufficiently relevant to MITRE customers and staff. Having been engrossed in both perspectives, we were primed to put together a workshop. Our goal? Help researchers and practitioners figure out how to connect and collaborate with one another more fruitfully than they had in the past. Design thinking would be the approach that enabled the connection. How might we revamp existing Academy of Management publications to be more accessible to management practitioners? Most of the participants were strangers to one another at the start of the session. 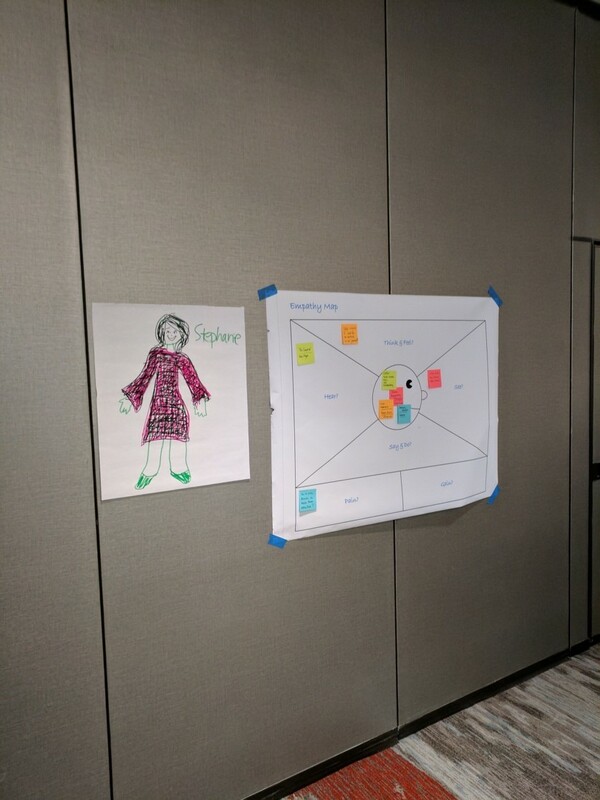 Together, they created personas of the practitioners they wanted to reach, empathy maps to help them discover why they weren’t reaching them now, and concept posters that helped frame what possible solutions might look like and how they could be implemented. After being on the go all day, Stephanie [the persona they’d confected] comes home to three young children with homework. No way she’ll have the energy to read a 30-page article. What if we put a callout of tips at the beginning of the article instead of in the appendix? I’m reading through some of the titles of the latest AOM journal issue, and I can’t even understand the title, much less the abstract or the article itself. These titles need to be shortened and re-written. Managers that I know don’t have time to read through pages of text. But if that text was converted into some useful visuals that they could interpret quickly, that might be more useful. As they worked, the groups marveled at how well they could share ideas around a common problem so quickly. One of the teams was so proud of their work that they would not let us take down their artifacts after the session, even when there was another workshop about to start in the same room! What might we design together? Our work (within MITRE and with government agencies), our recent research, and our engagement during the AOM conference have confirmed for us the remarkable ability of design thinking to engage a diverse, multi-disciplinary group of people around a common problem area very quickly. 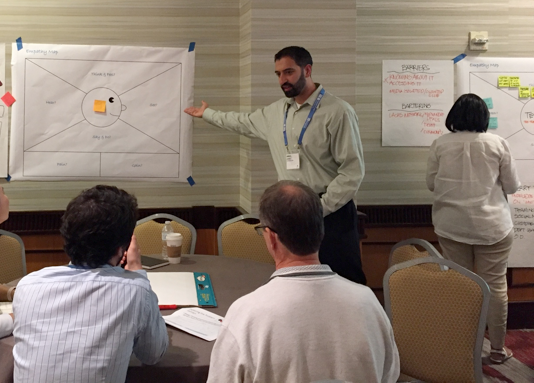 In Atlanta, we saw the approach generate ideas that left participants longing to experiment with them—the first step in bridging the scholar-practitioner divide in management science. The positive energy, awakenings, and willingness to go “do” aligned with MITRE’s research over this past year on the application of design thinking across government. If you work for a government agency and are looking for ways to solve complex problems by engaging a diverse set of stakeholders in a research or mission setting, feel free to contact us to start a conversation. If you would like more information about some of the most promising practices that emerged from our research on how design thinking has been applied by practitioners across 10 different agencies, feel free to contact us to start a conversation about that, too. You can reach us by leaving a comment below or via kde@mitre.org. Awais Sheikh is a principal multidisciplinary engineer, currently is serving as the steward for MITRE’s Business Innovation Capability. In this capacity, he is maturing MITRE’s approach to delivering business innovation to customers through research, development of toolkits and collateral, and application of subject matter expertise. He was trained in and has applied design thinking to help organizations explore complex problem areas and generate conceptual solutions that are testable. Mr. Sheikh has facilitated design thinking sessions for the Departments of Homeland Security and State, and with internal MITRE project teams. He served as the principal investigator for a research project to better understand the application and outcomes of design thinking across the federal government, and speaks at conferences on topics such as agile and design thinking.